Is the Arab world heading for more desertification, and will future wars erupt over water, as predicted by analysts, rather than oil? The region's dryness goes back 5,000 years, said Dr. Farouk El-Baz, a leading international expert on the subject, who nevertheless urged serious study of weather cycles, in a bid to adapt to the Earth's changing environment and the major forces affecting it. "Further, we should become aware of the changes that result from human activities and attempt to ameliorate their effects on the environment of our life-giving planet," he said. With climate change taking its toll on world resources, and weather patterns wreaking havoc, El-Baz said humans must realize what they're imposing on the Earth if they are to ensure sustainable development and self-preservation, since natural resources are finite. He plans to highlight the issue at the Arab Environment 2009 conference organized by the Arab Forum for Environment & Development (www.afedonline.org) in Beirut, Lebanon this November that will precede the United Nations Climate Change Conference in Copenhagen in December. 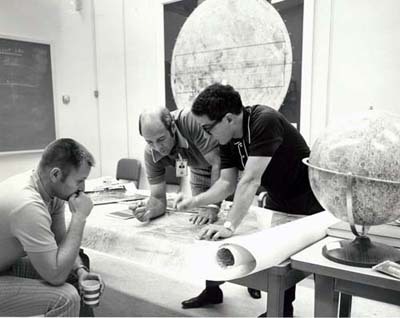 It's natural for El-Baz, who began studying the Earth as a geologist, before turning to outer space as supervisor of lunar science planning and operations at Bellcomm, Inc., a division of AT&T, that conducted systems analysis for NASA. At NASA he helped select Apollo 11's landing craft touchdown location. So how does a geologist make that stratospheric leap and reconcile scientific curiosity with religion and religious skeptics? "In reality, I never left geology. My Ph.D. was about how to characterize mineral deposits such as lead and zinc," he said of his landing sites selection based on geological significance. He was also responsible for training astronauts in making meaningful observations about their lunar environment, so it was a perfect fit lasting from 1967 to 1972. "All along, I never encountered anything in science that contradicts religion," El Baz said. "Anyone who strongly believes in the power of creation has no problem with scientific details. The two are not mutually exclusive." El-Baz was known as "the King" to the astronauts he trained during the Apollo program. While circling the moon with Mission 15, astronaut Alfred Worden said, "After the King's training, I feel like I've been here before." In Tom Hanks' HBO TV series "From the Earth to the Moon," El-Baz' role as Apollo astronaut trainer was featured in a segment entitled "The Brain of Farouk El-Baz," and a shuttle craft named "El-Baz" soared through the popular TV program "Star Trek: The Next Generation." El-Baz went on to plan photography and observations of the Earth's features from space, and advancing the techniques of orbital photography. 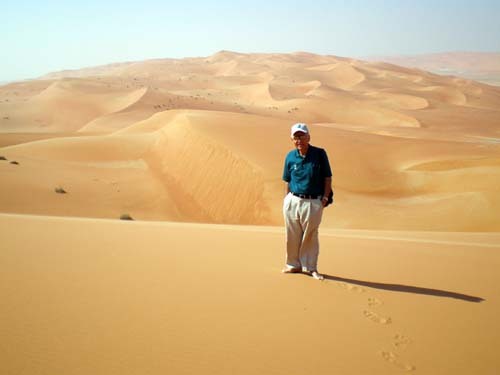 His various experiences fed his interest to study the world's deserts and how to explore for groundwater in an increasingly parched Arab world. Geology was the common thread. 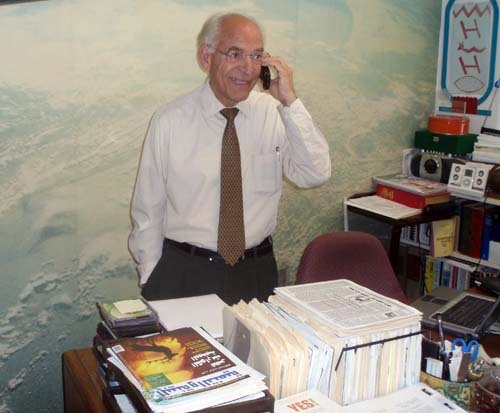 The 71-year-old Egyptian-American, who is Research Professor and Director of the Center for Remote Sensing at Boston University, is just as keen today about the wonders of science as when he began studying chemistry and geology at Ain Shams University decades ago. 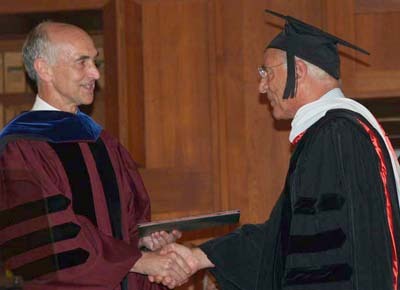 In an address, while accepting an honorary Doctor of Humane Letters at the American University of Beirut, El-Baz said creation of a knowledge society in the Arab world was the only guarantee for a brighter future. "There is no question that what we need most in the Arab world is a first-rate education. I am the product of such an education. My teachers and professors taught me how to carefully observe, investigate and conduct meaningful research." El-Baz said Arabs of the past had learned from their forebears and worked diligently to add to human knowledge. In so doing, they established the basis of Western civilization. "Encouraging excellence and rewarding innovation increases the potential of a nation," he emphasized. Asked how realistic that was in impoverished developing countries -- many in the Arab world -- where national budgets often go to defense acquisitions, or are spent solidifying governments' grip on power, El-Baz said creation of such a society did not require vast wealth. "It only needs leadership, long-term vision, and loyalty to the professions," he explained, noting that poorer and less-endowed nations like Malaysia, Indonesia and South Korea exemplified knowledge societies on a par with highly advanced European countries. To that end, he encourages renewed interest in space exploration, despite doubts about its necessity in times of financial hardship. The misconception is that spending money on missions into space is extravagant, he said, because little thought is given to how funds are appropriated and what the by-products of such endeavors are -- with creation of jobs at all levels being a prime example. "It is instructive to note that nations that initiated major space efforts have greatly benefited economically," El-Baz explained, pointing to Japan, India and China where war, chronic famine, and a huge population could have crippled those countries, but whose major space efforts 30 years ago had thrust them into the technical and economic big leagues. 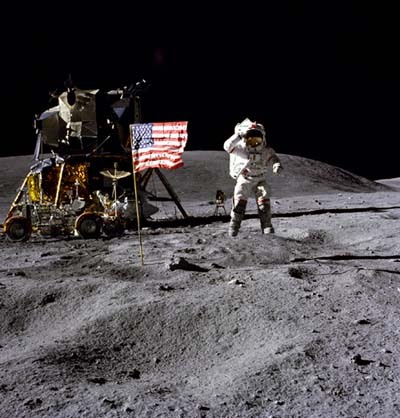 So, 40 years after the lunar landing, are young people interested in what was achieved back then? El-Baz, whose list of accomplishments is staggeringly impressive and too long to enumerate (www.faroukelbaz.com), strikes a positive note. "The younger generation of today is fascinated by space exploration and members of that generation ask the most probing questions," he said of his encounters with students. But fascination should be coupled with a good science education. Asked if enough was being spent on teaching science in the U.S., Europe and Arab world, and whether India, China and Russia had jumped ahead of the West, El-Baz said funding was adequate in the developed world, totaling 2% of GDP. "In the Arab world in general, this amount is about 0.2% of GDP, which means (it) should be multiplied ten times," he said, explaining that fewer than 25% of students entered science fields.